Redfish can be targeted on any tide in Florida Bay, however I prefer the low stages of the tide where they are easier to spot. In the Bay we will pole the flats over turtle grass, wire grass, mudflats, wheel ditches (small creeks), island edges and “potholes” (green deep spots on the flats) looking for the classic red tail to dimple the water, or see them, either in schools or singly cruising, hunting for small crabs or shrimp. Once I caught eleven redfish casting a spoon fly into one little pothole five feet in diameter - it was muddy with fish feeding! Sight fishing is the predominate way I fish for them out front and a 6wt rod is my choice. When sight fishing we'll look for tailers, mudders, cruisers and headwakers. The key is to spot the red and cast in or near its path and let the weighted fly settle to the bottom. When the red is near “sweep” the rod gently or twitch the fly for the take. You will see the fish eat and you’re on. They bull or tug hard - there are no blistering runs here. Yes they are excellent eating but I strongly recommend catch & release. Trouble shooting: It all sounds easy - right? Wrong! Some days you can’t even raise the rod for the cast and they sense something and flee in terror! When this happens watch carefully and you will notice that at some distance point they will slowly change course away from the path of the boat like your boat has body odor at a perfume convention. Here is some sage advice if that happens. Use clear fly lines and the lightest rod possible. There are a few reasons why they flee: the water is clear, you’re between the sun and the fish casting a shadow towards the fish, or the water is so shallow they are sensing the boat. To fix this, change the direction of the boat and wear light, not bright, colored clothes, pole slowwwww and keep body movements to a minimum. Many times I will simply leave - though its hard to leave fish to go find fish. But, if we can find water that is off colored or riled up by feeding fish or bait, that's the best ambush situation. The other problem that will crop up is that they seem to ignore the fly. Switch to a small crab pattern or when this happens even flies like crazy charlies can work great. 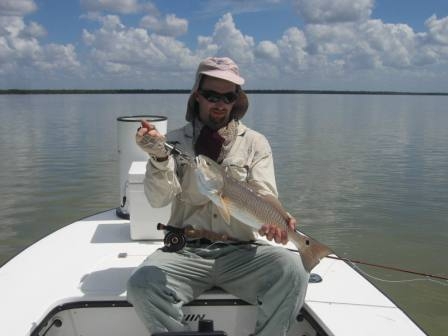 Redfish in Florida Bay eat mainly crabs, small shrimp with big green eyes and finger mullet. They also will bust minnows called peripheral fish.These fish of over eighty species live part or most of their lives in marine waters. Sailfin mollies and killifishes make up the bulk of these minnows. At times you will see strange behavior when fishing for redfish. You might see a big “swirl” and you never see the red! When you see that they are mostly likely chasing small shrimp to the surface. Sometimes you will see mudding fish ignoring your fly -its crabs! Switch to a small crab pattern or mangrove critter fly. Then again, you might see a redfish “blow-up” under the boat, after you've just passed over it. This means one of a couple of things: 1) the water is cold and they are dormant in the mud; or 2) the tide is slacking and they are waiting for the water to flow again. Many times you will see a red or reds with their backs out of the water simply lying dormant. Cast the fly and bump them with it and many times they will explode on it! 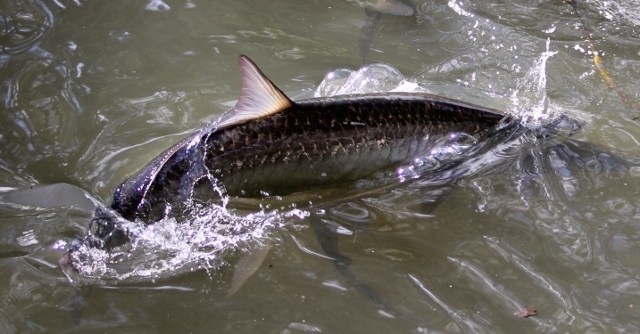 Leaders: Use a 9ft or shorter with a shock tippet of 20lbs in case the leader nicks something or a snook is sighted. Flies: mullet/minnow patterns white/chartreuse, small crab patterns in green/creme or tan, shrimp patterns with polar fiber tails (marker with brown marker) and ice chenille head/rubber legs and spoon flies. ALL flies must have weed guards and weight is suggested for half of your redfish flies. 1/0 hooks preferred. 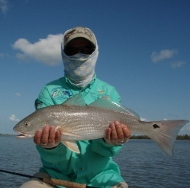 To read about Redfishing on Fly in the Everglades Backcountry, click here. Or to return to the Home page, click here.